Below is a brief outline of the information found on your Assessment Notice. For additional information please visit our Real Property Value Notices web page. As you move your mouse pointer over each section of the sample value notices, the corresponding description will be highlighted on the right. Click Here to download a PDF version of this page. This section identifies your property by the Assessors Parcel Number and the common street name and number. We also identify the tax district we have on record for the property. For more information on your property please visit Property Assessment Data web pages. For more information on Tax Districts please visit the Treasurers Office web pages. 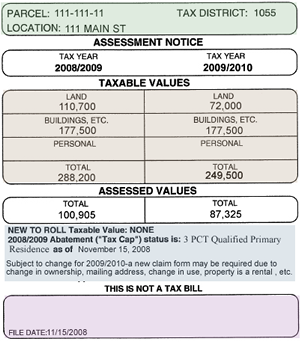 This is the taxable value for this property. It is broken down into land and improvements as they are each valued differently. For additional information on how taxable value is determined please visit our Real Property Appraisal web pages. If you disagree with these values please read our Real Property Value Notices web page for instructions on contacting our office for assistance OR filing an appeal with the County Board of Equalization. T his is the total assessed value for this property. 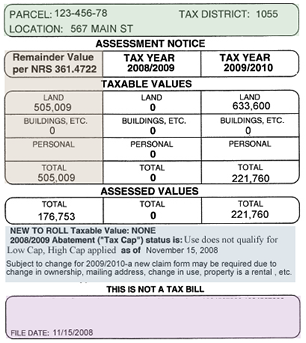 Pursuant to Nevada Statutes the assessed value is 35% of taxable value. This is the value the Treasurer uses when calculating the tax bill. This section contains information related to the partial abatement for this property. The partial abatement is more commonly known as the tax cap. For additional information on the partial abatement please visit our Tax Cap Information web pages. If you disagree with this information you can file a petition to review the information. The method to appeal this information is different than appealing your property value. For additional information please visit our Partial Abatement Appeals web page. This box may contain notes regarding your valuation or other information about your parcel. For clarification on the notes or any other information please contact our office at (775) 328-2233. The date in this area is the date we pulled the data for this value notice from our database. If the parcel was new and it was determined to be a Remainder Parcel for purposes of calculating the partial abatement you will see this column on your value notice. This is the value the Treasurers Office will use to determine the prior year taxes on this parcel when calculating the tax bill. For more information on partial abatements please visit our Tax Cap Information web page. For information on how to appeal this value please visit our Partial Abatement Appeals web page.